Although historians are interested in studying all the social types that make up a culture, one type is often neglected, that of the tourist. Finally, there is a book that greatly improves our knowledge about this elusive subject. 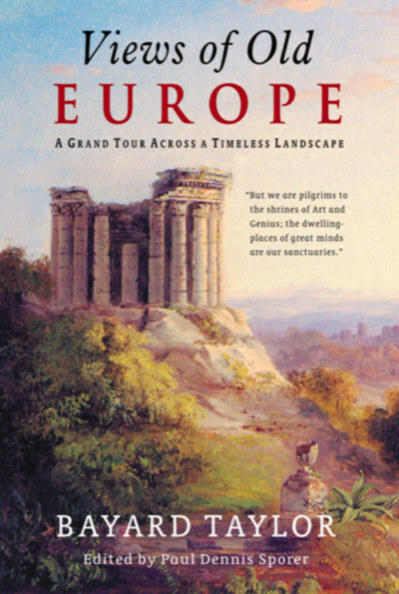 Views of Old Europe by Bayard Taylor gives us a rare opportunity to discover what an American tourist experienced on a two-year long journey in the 1840s, mostly on foot, through Britain, Ireland, Germany, Italy, France, Austria and Switzerland. The work was very popular, the original edition being followed by several further printings in less than two years. No doubt, the fame that attended the memoir was due to its multi-faceted nature. Perceptive observations about European society are set against the background of the journey narrative, which keeps moving at a deliberate but very pleasant pace. In these observations, Taylor strikes just the right balance between panorama and detail. The communities of that time, in all their charm, ebullience, traditional customs, and protectiveness, are brought into clear focus, facilitated by the copious notes kept by the author. Over the long course, a variety of beauties both natural and man-made were encountered: mountains, rivers, lakes and woods, as well as galleries, museums, churches, mansions, and cathedrals. But Views of Old Europe makes clear that the tour had its share of challenges, including fatiguing hikes on back-roads, inadequate funds, and avoiding robbers. For Taylor, the advantages greatly outweighed the hardships, and his fond reminiscences are evinced in truly lovely prose that still resonates with us today.